(Newser) – President Obama visited Louisiana this afternoon, seeing for himself the effects of the continuing oil spill and promising an "all-hands-on-deck" reaction, the Times-Picayune reports. "BP is responsible for this leak. BP will be paying the bill," he said. "But as president of the United States, I will spare no effort until this spill is cleaned up." Gov. 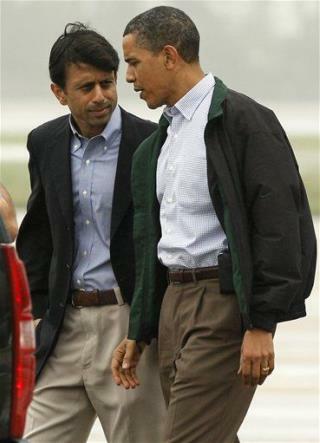 Bobby Jindal met Air Force One at Louis Armstrong airport near New Orleans, and they drove 2 hours to the coast. Poor weather prevented the president and his entourage from taking a helicopter tour of the region, where waves of oil are washing ashore, reports CNN. Federally regulated fishing grounds from Louisiana to Florida have been closed and will remain off-limits for at least 10 days, reports the Tallahassee Democrat. Corporate person British Petroleum will pay just like it's monopoly brother Exxon. Exxon has still not paid even the highly reduced punitive damages (by the activist Bush SCOTUS) for the Exxon Valdez spill in Alaska. 5 billion reduced to 2.5 billion then to 507.5 million unpaid while on appeal since the spill happened in 1989. Exxon claims the maximum it owes in punitive damages is 25 million. Why would anyone think BP will be treated any different than Exxon was by US regulators or our corporate friendly federal courts? That would be UNFAIR to another valued corporate person! If we believe it is because Obama said so...we will be surely disappointed. He may want it to be true, but it will never happen unless BP does it out of the goodness of it's corporate heart. That claim is not worth the carbon dioxide that was exhaled with the promise. I Know..(<:.. is all Grorge Bushes Fault.. I'm no fan of big oil, but it seems that BP has so far pretty well stepped up to the plate, accepting responsibility for the clean up of this mess. I, however was not aware that the investiigation into the actual cause of the spill, had been completed. Does President Obama know something we don't?